So — good news for Jay Inslee, right? The Washington governor and former congressman has held political office for almost 30 years, and he’s 68 years old. But, of course, he’s trailing badly in the polls — a different Morning Consult survey out this week pegged him at 1 percent. The reality is that what voters say they value doesn’t appear to match which candidates they support. Either they aren’t expressing their true priorities to pollsters, or they use other factors — such as whom they identify with — to choose their candidate. Indeed, what voters say they value can change depending on which way the political winds are blowing. To see this, we need only go back to the last presidential primary. In March 2015 — the same point in the 2016 cycle as we are in now for the 2020 cycle — 57 percent of Republican and Republican-leaning voters told the Pew Research Center that it was more important for a candidate to have experience and a proven record than new ideas and a different approach. Only 36 percent preferred a candidate with a fresh approach. But when Pew asked the same question just six months later, the results were reversed: 65 percent of Republicans and Republican leaners preferred new ideas and a different approach, while 29 percent said experience and a proven record were more important. What happened in between? Well, Donald Trump announced his candidacy and shot to the top of the GOP field in polls. And in the heat of the 2016 general election, white evangelicals (who are overwhelmingly Republican) appeared to relax their moral and religious preferences for President Trump. In a 2011 poll from PRRI, just 30 percent of them agreed with the statement that “an elected official who commits an immoral act in their personal life can still behave ethically and fulfill their duties in their public and professional life.” In 2016, that had shot up to 72 percent. In short, voters’ ideas of what they want may be theoretical. 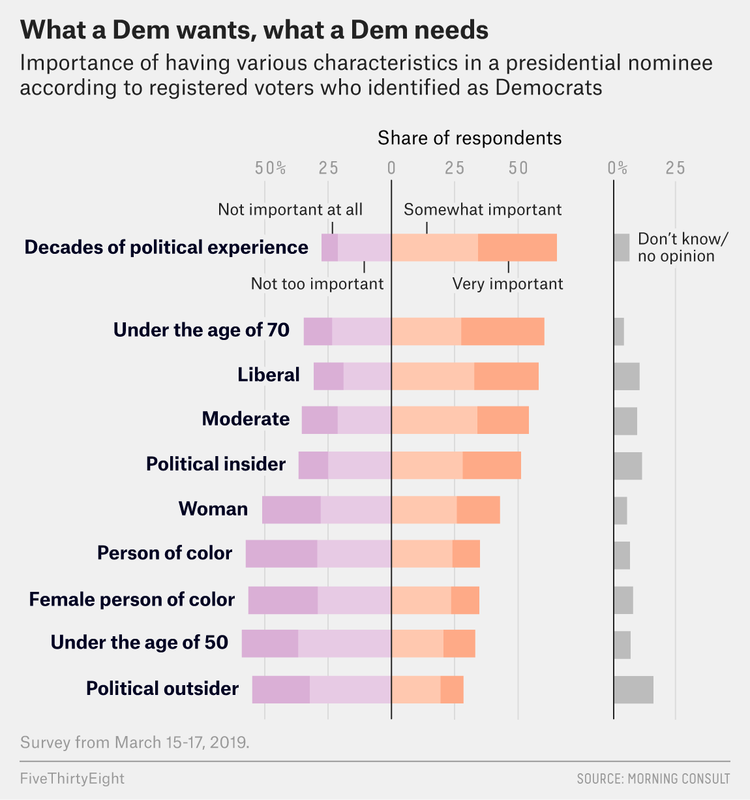 Another example: In that first Morning Consult poll, 59 percent of Democrats said it was “very” or “somewhat” important that their candidate be a liberal while 55 percent also said it was “very” or “somewhat” important to nominate a moderate. There has to be at least some overlap there! Voters want their nominee to check as many boxes as possible, but eventually they have to settle for someone who falls short on a few measures. Alternatively, voters’ interpretations of a candidate’s brand may be hard to pin down. For instance, Sen. Bernie Sanders ran in 2016 as an outsider candidate, and while he is once again calling for a “political revolution” in his 2020 campaign, Morning Consult found that voters rated Sanders as one of the more insider-y candidates in the Democratic field — second only to former Vice President Joe Biden. If nothing else, this is yet another warning that commonly discussed ideological “lanes” may not accurately reflect how voters approach the primary. On Monday, President Trump tweeted, “A Suffolk/USA Today Poll, just out, states, ‘50% of Americans AGREE that Robert Mueller’s investigation is a Witch Hunt.’” Trump quoted the poll result correctly, but the question he’s referring to may have been confusing to some respondents because it had two parts: “President Trump has called the Special Counsel’s investigation a ‘witch hunt’ and said he’s been subjected to more investigations than previous presidents because of politics. Do you agree?” Some people who said “yes” might have been responding to only the second half. According to a new Siena College poll of New York state, Democratic U.S. Rep. Alexandria Ocasio-Cortez has a favorable rating of 31 percent and an unfavorable rating of 44 percent. It’s notable that she has a negative net favorability rating (favorable rating minus unfavorable rating) in a state as blue as New York; by contrast, the state’s senior U.S. senator, Chuck Schumer, has a +10 net favorability rating. But, of course, Ocasio-Cortez is not a statewide elected official; chances are that she’s much more popular within her New York City district (the 14th District). Within the city, her net favorability rating is above water (43 percent approval vs. 37 percent disapproval). Got a few bucks riding on that March Madness pool? If so, you’re among the 36 percent of American adults who at least occasionally bet on sports, according to a poll by the Associated Press and NORC Center for Public Affairs Research. But while 60 percent of Americans support the legalization of betting on professional sports, only 42 percent believe betting on college sports should be allowed. Trump drew criticism for autographing Bibles during a visit to a tornado-stricken area of Alabama earlier this month. A Morning Consult poll released this week found that 64 percent of Americans think that was inappropriate (21 percent said it was appropriate). Among white evangelical Protestants, 45 percent said Trump’s signing of Bibles was inappropriate, and 35 percent said it was appropriate. The conservative anti-tax group Club for Growth released a poll last week that found that U.S. Rep. Mo Brooks would defeat former Alabama Supreme Court Chief Justice Roy Moore 52 percent to 32 percent in a head-to-head Republican Senate primary matchup. Neither Brooks nor Moore — who has been plagued by scandal and lost a 2017 special Senate election to Democrat Doug Jones — is officially in the race. But the Club is arguing that Brooks is better positioned to defeat Moore than is U.S. Rep. Bradley Byrne, who is an active candidate and has been criticized by the Club. According to FiveThirtyEight’s presidential approval tracker, 41.6 percent of Americans approve of the job Trump is doing as president, while 53.1 percent disapprove (a net approval rating of -11.5 points). At this time last week, 41.6 percent approved and 53.5 percent disapproved (for a net approval rating of -11.9 points). 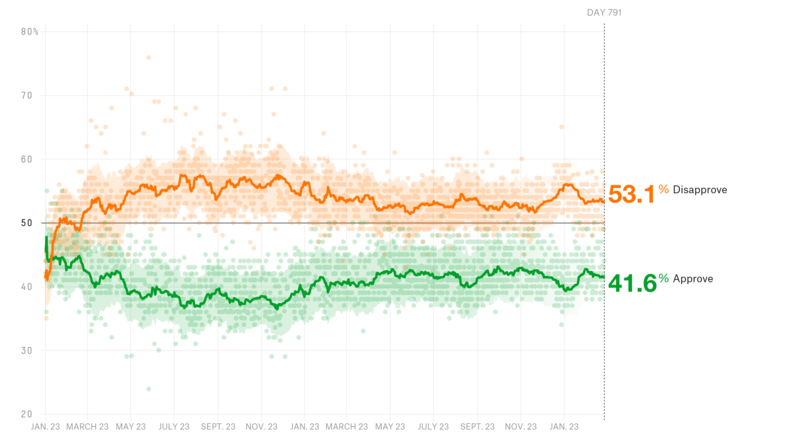 One month ago, Trump had an approval rating of 42.5 percent and a disapproval rating of 53.2 percent, for a net approval rating of -10.7 points.